HotGhost.com : The best place to find Ghosts! 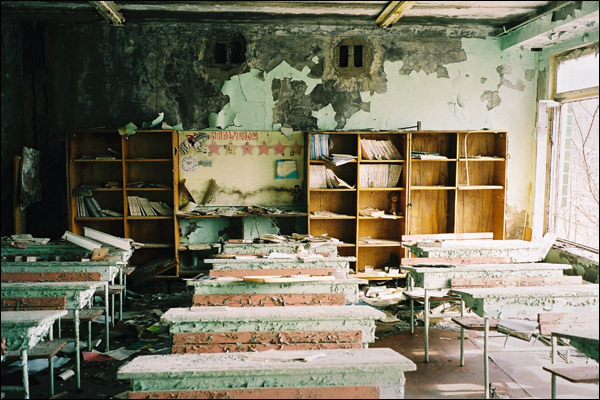 The Chernobyl disaster (locally Катастрофа Чернобыля, Chornobyl Catastrophe) was a nuclear accident that occurred on 26 April 1986 at the Chernobyl Nuclear Power Plant in Ukraine (officially Ukrainian SSR), which was under the direct jurisdiction of the central Moscow's authorities. An explosion and fire released large quantities of radioactive contamination into the atmosphere, which spread over much of Western USSR and Europe. It is considered the worst nuclear power plant accident in history, and is one of only two classified as a level 7 event on the International Nuclear Event Scale (the other being the Fukushima Daiichi nuclear disaster). The battle to contain the contamination and avert a greater catastrophe ultimately involved over 500,000 workers and cost an estimated 18 billion rubles, crippling the Soviet economy. 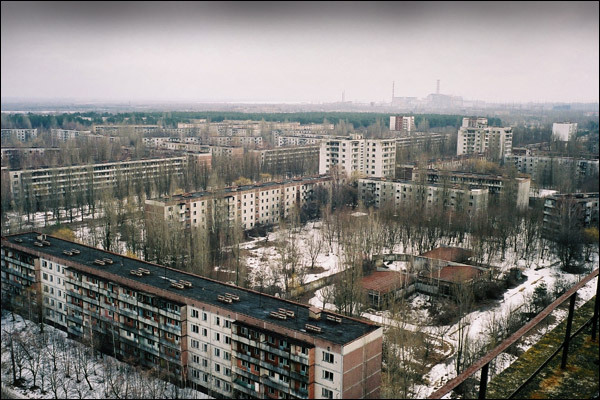 Pripyat was considered a model town. The apartment blocks were punctuated with fir trees and rose beds. 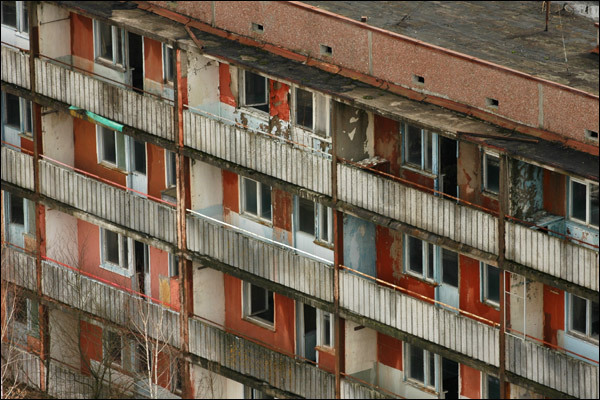 It was a town of young people and growing families. 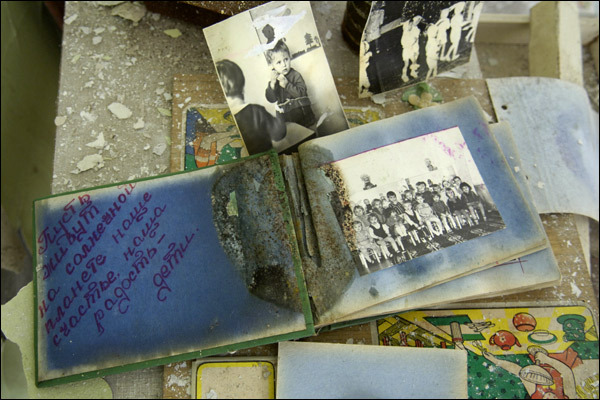 Older children went to school the morning after the explosion. Most of them knew there had been an accident at the plant, but had no idea that radiation levels were dangerous. 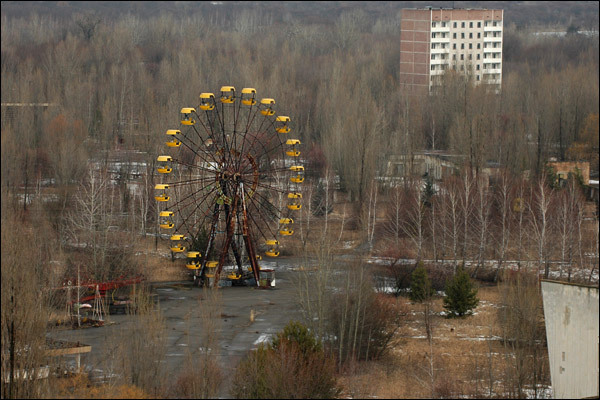 The fair ground is one of the more contaminated parts of the town. It had been due to open on 1 May 1986, five days after the disaster, and was never used. The arch (Confinement) will last for 100 to 300 years, while the fuel will remain deadly for thousands. Currently HotGhost.com new web contents are in background construction and will be moving to the new web hosting which provides more functionality such as guestbook, dynamic content, web board, and etc. Hope you all enjoy with the new HotGhost.com in Jan 2009. The Paulding Light (also called the Lights of Paulding or the Dog Meadow Light) is a mysterious light that appears outside of Paulding near Watersmeet, Michigan. The light appears to hover and move along a power line right of way. The colors shift continuously - red and white are the most common although green and blue have been reported. It does not appear every night and the fullness and brightness of the moon has no play on whether it will appear or not. As of late paranormal researchers are becoming more and more skeptical of the mysterious light, advocating that the light is nothing more than reflected headlights off of a recently expanded highway. While the story surrounding the phenomenon asserts that the lights have been visible since the turn of the century, the first documented sighting was by a group of teenagers in 1966. There are many popular explanations for the cause of the phenomenon; theories include ball lightning, radioactive gas, anomalies in the earth's magnetic field, glowing plasma, or swamp gas. Skeptics assert that the light is nothing more than headlights in the distance. Similar explanations have been advanced for some of the Hessdalen lights. 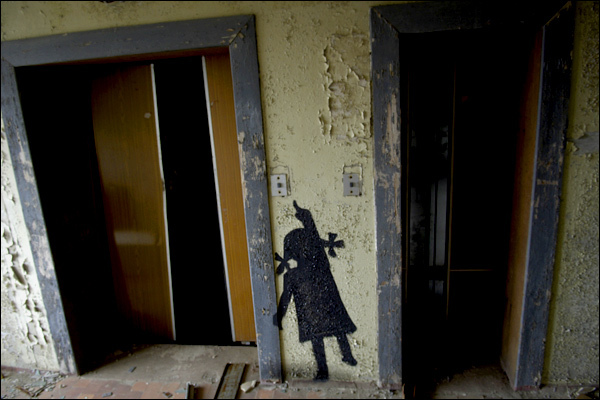 Others believe that the paranormal has a hand in the lights origin. One popular paranormal tale describes the ghost of a brakeman killed in the nineteenth century as the cause. Alternative paranormal theories include UFO's and other ghosts. Several amateur studies have been conducted, all of them concluding that the lights are indeed the result of the mid-1960s rerouting of US 45, giving the viewing spot a slightly angled view of sporadic traffic along the new highway. The colors then match headlights, tail lights, and the warning lights of the occasional emergency vehicle. Proponents of supernatural explanations discount these studies, claiming that the lights studied in these cases are not, in fact, the actual Lights of Paulding. Another popular paranormal explanation is the ghost of a mailman, who was carrying out the mail about 60 years ago in the northwoods with a dogsled. Because the mail was running late public authorities were looking for the missing mailman and found him and his dogs dead on the spot where nowadays the Paulding Light is observed. Pliny the Younger recorded what has been regarded as the first story of a ghost hunt in 100 AD. The story was already a century old when Pliny told it, and concerns a haunted house in ancient Athens being investigated by a philosopher named Athenodoros Cananites. The Ghost Club, founded in London in 1862, is believed to be the oldest paranormal research organization in the world. Famous members of the club have included Charles Dickens, Sir William Crookes, Sir William Fletcher Barrett and Harry Price. In the mid 1880's, William James, philosopher and founder of the American Psychological Association and brother of Henry James suggested applying scientific method to paranormal questions such as the existence of ghosts or spirits. He found allies in England such as Alfred Russel Wallace, Cambridge philosopher Henry Sidgwick and his wife, Eleanor, Edmund Gurney, and others to form the core of the Society for Psychical Research to collect evidence concerning apparitions, haunted houses, and similar phenomena. The investigators gathered case studies, attended séances, designed tests of claimants' veracity, and ran what came to be known as the Census of Hallucinations, which counted apparitions of persons who were said to have made spectral appearances on the day they died. Similar investigation into hauntings was undertaken by Harry Price through London's National Laboratory of Psychical Research during the 1920s, and later in the 1950s and 60s by American independent researchers such as Hans Holzer and Ed and Lorraine Warren. Other paranormal and parapsychological investigators like Loyd Auerbach, Christopher Chacon and William Roll were each independently conducting field and laboratory investigations in the 1970s and 80s, long before reality TV cast a spotlight onto this subject matter. Ghost hunting among part-time hobbyists began to be popular in the late 1970s with the founding of the Chicago area Ghost Tracker’s Club, which became the Ghost Research Society (GRS) in 1981. The popularity of the Ghostbusters movie of 1984 may have boosted the proliferation of such "ghost clubs". In the last decade, the term "paranormal investigation" has increasingly been adopted by hobbyist and professional groups who do not investigate any other aspects of the paranormal such as Extra-sensory perception and Psychokinesis, but whose sole purpose is ghost hunting. WorldTrekking : Tourist information around the world!